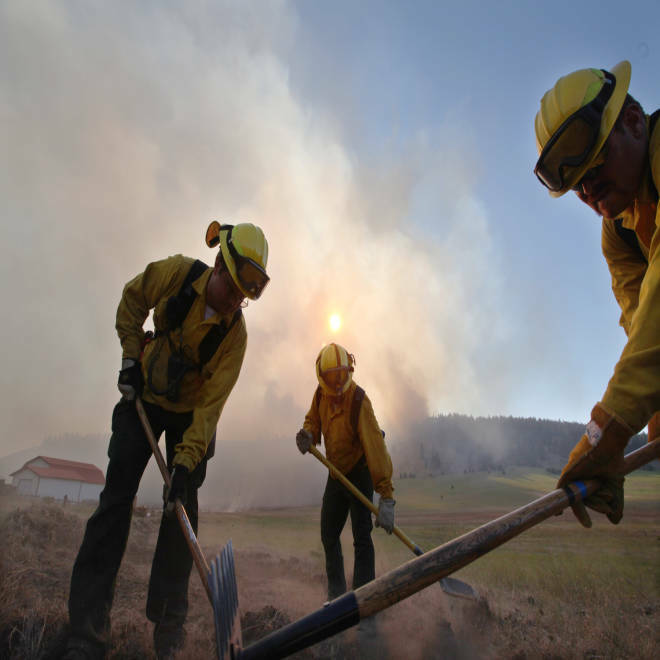 Firefighters work to create a break from the fire burning behind them near Cle Elum, Wash. Firefighters from around Washington state converged Wednesday on a wildfire that destroyed dozens of homes, just one of the blazes being fought across parched western states. More than 800 firefighters were expected to help fight the Taylor Bridge fire in Eastern Washington, joined by 145 prison inmates and a couple of National Guard helicopters, according to NBC station KING in Seattle. As of Wednesday the wind-driven fire had destroyed more than 70 homes and 28,000 acres southeast of Cle Elum, a city 80 miles east of Seattle, in Kittitas County. KING reported fire crews will make an effort to protect the Hidden Valley area on the fire's north edge and the Sun Light Waters area on the southern edge. State Department of Natural Resources Fire Incident Commander Rex Reed said the fire is 10 percent contained, The Associated Press reported. "We've had a long prolonged dry period — three weeks with no precipitation at all," Reed told the AP. 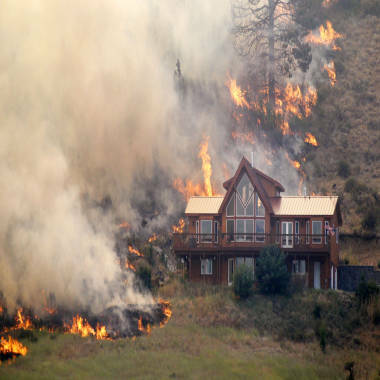 Flames surround a house on a hillside above Bettas Road near Cle Elum, Wash.
Gov. Christine Gregoire declared a state of emergency Tuesday in the central Washington counties of Kittitas and Yakima. In Idaho officials expect the dry weather to feed the flames of the 63,000 acre Trinity Ridge fire. Dave Olson of the Boise National Forest told NBC station KTVB that he expects the fire to reach the nearby rural communities of Pine and Featherville in the immediate future. "It's not if, but when," he said. The fire had grown in the past 24 hours, according to officials. The U.S. Forest Service urged residents in the area to prepare for evacuation on Wednesday. A 20-year-old fire fighter died Sunday while fighting the blaze. Anne Veseth was part of a 20-person crew trying to establish and reinforce a fire line on one perimeter of the 43-acre fire when she died after being struck by a tree. The Idaho Statesman reported around 850 firefighters were working the fire, which started on Aug.3. Two fires raging in northern California have so far destroyed almost 8,000 acres and one home but are 70 percent contained, according to Daniel Berlant of the California Department of Forestry and Fire Protection. The fires, one dubbed the Wye fire in northeastern Lake County and the other called the Walker fire in nearby Colusa County, closed a portion of Highway 20 but it has since reopened, according to the Appeal-Democrat. Around 1,200 personnel and 157 fire engines were working the fire. The Walker fire in Colusa County threatened a clothing-optional resort in the area. Two firefighters suffered minor injuries. Other communities are still threatened but the danger has been reduced. The two fires started Sunday afternoon several miles apart along Highway 20, the Press-Democrat reported. To the east, in Plumas National Forest, in the Sierra Nevada in Northern California, crews had to pull back Wednesday after a thunderstorm moved into the area and blowing embers spread the blaze, according to the station. "The day was not a good day," fire spokeswoman Alissa Tanner said. "We had some issues with that southern end of the fire." That blaze had burned more than 58 square miles as of Wednesday. In Southern California, one fire near Aguanga in Riverside County destroyed 4 1/2 square miles in just hours. One person was treated for serious burns. Air tankers dropping retardant aided firefighters during the day. A fire in Joshua Tree National Park burned almost 300 acres, NBC station KCRA reported.